Grand Forks General Sports. Grand Forks Herald. Wed, 24 Apr 2019 05:00:49 +0000. Fargo-Moorhead area elementary school students can enjoy a fun night of games and learning during the annual Math Night, presented by the NDSU Department of Mathematics. North Dakota State University. Mon, 22 Apr 2019 09:05:02 -0500. ABC News. Fri, 19 Apr 2019 12:18:28 -0400. ABC News. Thu, 18 Apr 2019 15:37:56 -0400. Greg Peterson. Farm Journal Media. Tue, 16 Apr 2019 16:47:00 GMT. Reuters. Fri, 12 Apr 2019 12:20:22 -0400. Kyle Stock. Los Angeles Times. Mon, 8 Apr 2019 16:15:00 PDT. Officials are closing a bridge connecting Grand Forks, North Dakota, and East Grand Forks, Minnesota, in anticipation of Red River flooding. Star Tribune Staff. Star Tribune - Minneapolis, Minnesota. Sun, 07 Apr 2019 22:50:09 +0000. Washington Times. Sat, 06 Apr 2019 15:15:55 -0400. "What people are seeing now is the power of the river," said Fargo Mayor Tim Mahoney. Mary Lynn Smith. Star Tribune - Minneapolis, Minnesota. Sat, 06 Apr 2019 15:48:07 +0000. According to the 2010 census, the population of North Dakota was 672,591. In 2008, the estimated population of North Dakota was 641,481, whereas in 2006, the population of North Dakota was about 636,453. For detailed, up-to-date information about North Dakota's demographics, visit the U.S. Census Bureau's QuickFacts about North Dakota web page. For maps of North Dakota, visit this North Dakota Map website. 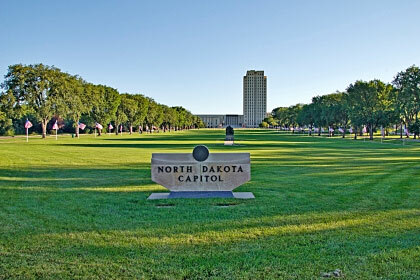 The photograph above shows the state capitol building in Bismarck, North Dakota. North Dakota newspaper publishers are listed here, along with their addresses, phone numbers, and website links; North Dakota library names, descriptions, and website links are listed on this page. More information about North Dakota can be found here.